The states of Washington and Colorado have legalized marijuana. Twenty-three states (in addition to the District of Columbia) have allowed the drug’s use for medical purposes. But the Food and Drug Administration still classifies marijuana as a “Schedule 1” drug, a category restricted to drugs that are both highly addictive and lack any evidence-based medical applications. Public opinion about marijuana certainly has changed, with 58% of Americans now in favor of legalizing it and a whopping 86% supporting medical marijuana. Even some politicians today aren’t afraid to show their support. “It defies logic in this day and age that marijuana is still in Schedule 1 alongside heroin and LSD when there is so much testimony to what relief medical marijuana can bring,” Gov. Lincoln Chafee of Rhode Island said in an interview with the New York Times in August. But there may be a logical explanation for the otherwise inexplicable balkanization of marijuana: There are vocal anti-marijuana advocates who are funded by the deep pockets of opioid manufacturers. 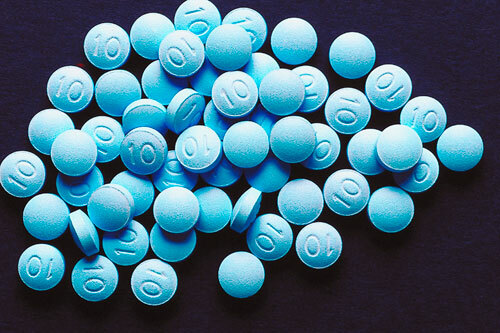 According to reports in Vice and The Nation, anti-pot lobbyists and researchers have been generously sponsored by pharmaceutical companies like Purdue Pharma, maker of OxyContin, and Alkermes, the manufacturer of the controversial painkiller Zohydro. These companies have also funded supposedly anti-drug-abuse groups like Community Anti-Drug Coalition of America (CADCA) and the Partnership for Drug-Free Kids. “According to critics, this funding has shaped the organization’s policy goals: CADCA takes a softer approach toward prescription-drug abuse, limiting its advocacy to a call for more educational programs, and has failed to join the efforts to change prescription guidelines in order to curb abuse. In contrast, CADCA and the Partnership for Drug-Free Kids have adopted a hard-line approach to marijuana, opposing even limited legalization and supporting increased police powers,” writes Lee Fang in The Nation. This is an odd partnership (to say the least), given that more than 16,000 Americans die from opioid painkiller overdoses each year. In contrast, earlier this year German researchers may have found the first two known cases of death from marijuana use. Clearly, there is a massive financial incentive for pharmaceutical companies to keep chronic pain patients dependent on opioids rather than on medical marijuana. So Big Pharma was no doubt concerned when a recent study found that states that have legalized medical marijuana have lower rates of opioid overdoses and deaths. The authors of the study, which was published this month in the journal JAMA Internal Medicine, suggested that one possible explanation could be that people are replacing their opioids with medical marijuana. However, the researchers were quick to point out that their study does not conclude that medical marijuana laws prevent opioid deaths: “Our study was not a controlled experiment, and it is possible that states with and without medical marijuana laws differed over time in important ways that we did not or cannot measure and that could explain, at least in part, our results,” the authors wrote in a New York Times op-ed. The New York Times recently profiled a researcher who believes she was fired from the University of Arizona because of her efforts to study the effects of marijuana on post-traumatic stress disorder in veterans. Before she was fired, researcher Sue Sisley, MD, spent more than three years jumping through bureaucratic hurdles to get her study approved—hurdles that she says do not exist even for other Schedule 1 drugs. Sisley is not alone in her frustrations with the government’s obstruction of marijuana research. Many researchers have complained that NIDA is reluctant to fund any research that might put marijuana in a positive light. Steven Gust, special assistant to the director at the NIDA, admitted as much in an interview with McClatchy earlier this year. “We’ve been studying marijuana since our inception. Of course, the large majority of that research has been on the deleterious effects, the harmful effects, on cognition, behavior and so forth,” he said. The FDA has, however, approved two medications that contain cannabinoids, which are active chemicals from the marijuana plant. Marinol and Cesamet are used to treat nausea caused by chemotherapy. A third cannabinoid-based drug, a mouth spray called Sativex, was fast tracked by the FDA earlier this year. But one has to wonder: are these drugs getting the green light because they are safer than marijuana, or because there is money to be made for the pharmaceutical companies? And how long will it be before we have an FDA-approved cannabis-based medicine for the treatment of chronic pain?